A while ago, I posted this blog about how the life-hacking community has a lot in common with Emergency Managers (we both have an attitude of self-sufficiency.) Then I posted my perspective on social activism (I’m for it.). 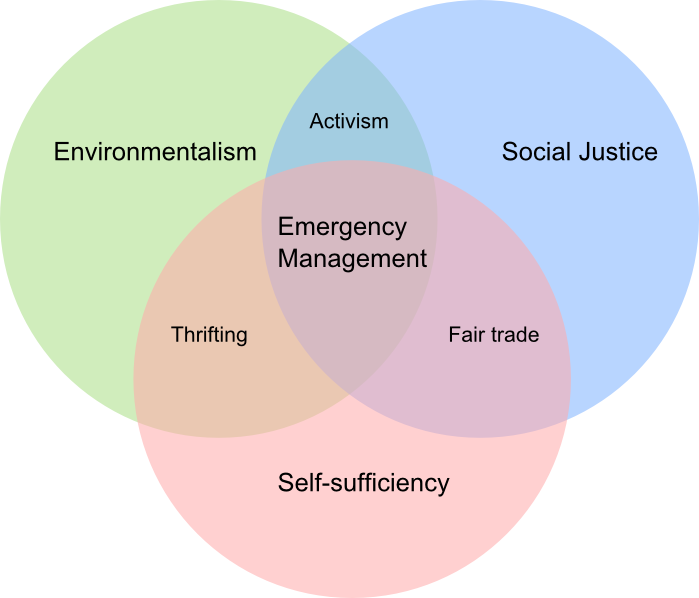 Now I want to talk about what Emergency Managers (and preppers) have in common with environmentalists. (Hint: It’s a lot). Social justice. Often it seems like people who care about the environment also care about equality issues. People are uniquely linked to the health of the environment and disasters expose the strength of this link. When, for instance, coffee farmers cut down the Rainforest to plant coffee plants, they expose the topsoil to heavy rains which wash away the nutrient-rich top soil. This leads to successively poorer crops which causes hungry farmers to cut down more Rainforest. Furthermore the rains–unchecked by strong trees–causes extreme flooding, much more than would’ve happened before the trees were cut , causing farmers to lose their homes and crops. Which, in turn, causes the country to become vulnerable to famine. Worsening cycles like this one are why we try to buy fair-trade crops and crafts. These situations are a good example of the synergistic mix between social and environmental issues. Disasters just bring these issues to salience. Bangladesh slum dwellers find helping the poor makes everyone more resilient. How well a community withstands a disaster is directly related to how well it has treated the local environment. A common example: if you fill watershed areas with dirt and pour concrete over it and the surrounding hills, you will get flooding. If you develop along coastlines, not only do you put more people in harm’s way, but you also erode the beach and damage the protective corals causing storm surges and tidal waves to travel farther inland than they would have before (we’re looking at you, Florida, Texas, and Louisiana). If you cut down forests and plow up grass, wind storms or flooding can carry away the top soil and damage both the recuperation power of the area and cause algea blooms in the ocean where all the nutrient-rich top soil dropped (Ahem, Dust Bowl). This might lead to a bad harvest and starvation (back to social justice again). Bali fisherman switch from fishing with cyanide (which bleaches coral) to other methods. Global warming is making disasters both more frequent and stronger. First world countries’ infrastructures are also getting (a little) better, but this is not true for third world countries. The worsening storms and unchecked development is causing more and more people to be vulnerable. Island nations are eroding away. African farmers can’t find enough water to give their plants. War is damaging the land and local economy. Refugees stress host nations. No one has enough money to migrate. There’s no where to put them if they could. All of this long-term suffering makes it harder for people to withstand disasters when they do strike. And since they’re striking more frequently, they can hardly recover before the next one comes. I’ve already discussed this here, so I won’t go on. Climate change has made flooding much worse in Vietnam. A better dam helps.